Myocrescat is a dietary macro-granulate that serves the effective stimulation of muscle development. To achieve a high level of performance, horses need well constructed muscles. Depending on the horse, muscles share about 40% of the total body weight. It consists predominantly of proteins and is responsible for the horse's movements and thus for its performance. Young horses: Supports the muscle development of young horses which are prepared and trained for competitions. Competition horses: Myocrescat supplies a high amount of amino acids to optimize the ration of concentrated feed and thereby assists the development of an optimal musculature. Breeding horses: Myocrescat provides brood mares with high quality amino acids required for the fetal development. Stallions: To fullfill the increased protein requirement of stallions that are used for sport and covering. Older horses: Myocrescat prevents muscle reduction and covers the increased requirements of high quality amino acids. Diets: Helps to serve muscles with amino acids in case of diets or reduced feed intake. In order to provide optimal nutrition to the musculature and to support muscle development, the horse needs amino acids as the basic components of proteins. L-carnitine is an additive which is of considerable significance for the maintenance of the muscle functions. It optimizes the energy supply of muscle cells and increases the maximum energy uptake capacity of trained horses. L-carnitine works against degenerative processes in muscles. 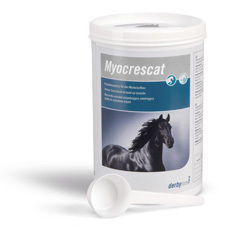 Myocrescat provides horses with 18 amino acids for the development of muscles and supports the formation of a durable high performance musculature. TIPP: To boost muscle growth even more effectively, derbymed recommends a combination of Myocrescat and Orysanol E.
It is recommended to use Myocrescat for a period of at least 4-5 weeks, depending on requirements (and in consultation with your veterinary) Myocrescat may be used continuously or in intervals. Myocrescat can be given with the feed.